The plot and characters are often interesting, but I’m lost. I need a map to figure out where I am. In other words, setting is crucial to keeping your readers grounded in your story. Often, the problem is that I don’t know WHEN the story is taking place. This could be anything from what century to what season of the year. The simple detail of a Christmas tree might be enough to reorient me to the setting. Or I might need details of clothing worn in 1492 to understand the setting. Either way, the relevant details must be woven into the story. However, you can often just add a simple phrase to indicate time: early that morning, an hour later, or meanwhile. The WHERE question can be much more complicated because it should be woven into the story seamlessly. One writer recently said that she was afraid to bog down her story with lots of description. That fear kept her from adding details that would keep the reader grounded. Novels aren’t screenplays or movie scripts; for those, you expect the production to fill in the blanks. For novels, though, you must play the movie in the reader’s head for them. Beats in dialogue. This is especially important in dialogue or conversations between characters. Another writer had nice dialogue, but it was all in isolation–talking heads. You must remember that the characters are people who fidget, move around, blunder around or just nod their heads. Of course, sometimes you DO want a section that focuses on words. But even there, the right detail at the right time can emphasize a point, add comic relief, or make the story more believable. Setting comes alive when you have the right details, usually sensory details. If you were a character in the story, in this particular scene, what would you see, hear, smell, touch, or taste? Description comes down to the careful use of our senses to put the reader into the scene. Often, I’ll create a sensory details worksheet. Down a side of a page, I’ll write the senses: See, Hear, Smell, Touch, Taste. Then, for each sense, I try to find three details unique to the setting. I’m also trying to do it in language that would be used by the POV character. Be specific as you do this. Notice that I didn’t say, “Big Dog.” The use of modifiers–adjectives and adverbs–weakens a story. Instead, I search for a more specific word, such as the name of a dog breed. Only after the verb or noun is as specific as possible do I allow myself to add modifiers. Be reasonable. Sometimes, “dog” is enough, depending on the story, where you want the reader to pay attention, and the intended audience. For a toddler’s story, Dog would be reasonable. Mostly, though, writers need to be more specific and avoid those adjectives that work as a crutch, but really add nothing to the description: good, nice, big, small, etc. A special note on Touch/Feel: Often writers want to translate this into emotions. Instead, I mean this as a physical sensation of touch, usually temperature or texture. Not: I loved my lunch. Instead: The chili burned my tongue. Once I have a list of sensory details, I like to start a scene with a unique detail. I search the imagined setting for something that will make a reader stop and pay attention. Here are some descriptions from the first pages of my Aliens, Inc. Series. The series is for 1st-4th grade readers, and each story begins in art class. Use the links to download sample first chapters to read more. It’s impossible to tell you how to balance the narrative descriptions, dialogue and action. As an author, you need to learn which area you are strongest in and which is your weakest area. If you consistently get the response from readers, “I’m lost,” then you need to provide more description. 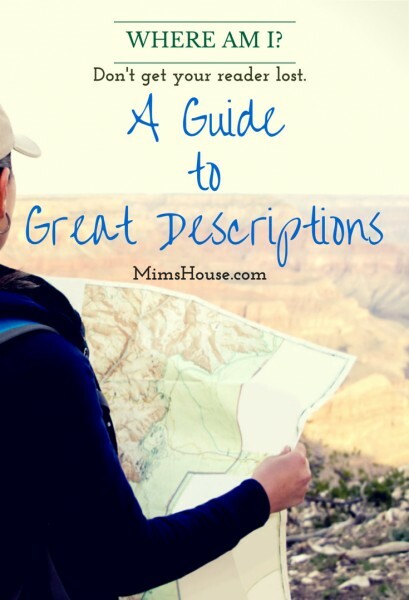 Don’t fear the descriptions. They won’t slow down the reader unless you really go overboard. But they can sure LOSE you a reader, if you get them lost. They won’t trust you to tell the story and will stop reading. In other words, listen to your early readers. If they are confused about what is happening, your descriptions are weak. If they are drowning in detail, the story will feel slow-paced. Work to find the right balance for your story and your readers. Just be sure they never get lost. I’m glad this helped! In a recent talk with an editor, I see that I need to up my descriptions for setting, too. It does ground the reader and that’s what we want. So glad you like the Alien books. They are one of my favs.